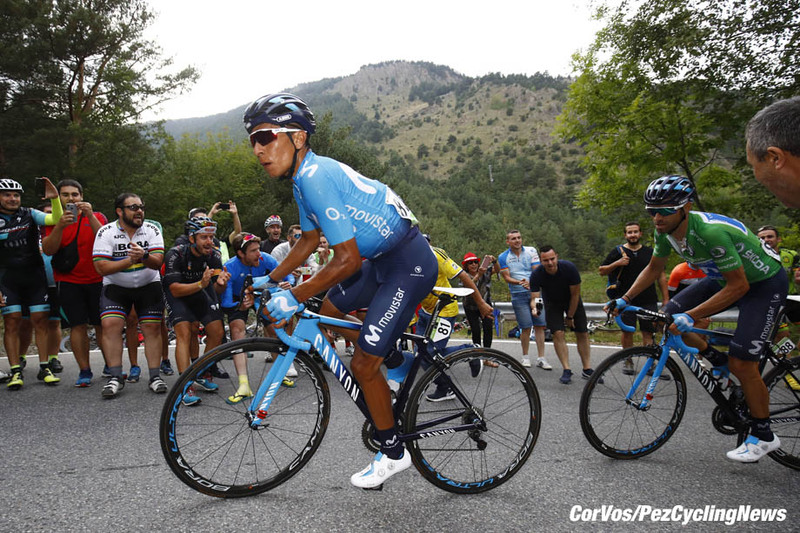 PezCycling News - What's Cool In Road Cycling : VUELTA’18 Stage 20: Yates And Mucho Mas Lopez – 1 2 3! 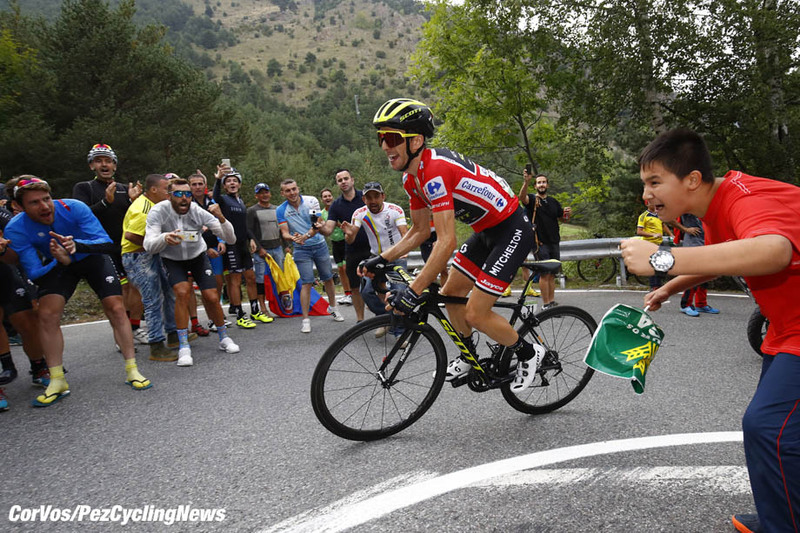 VUELTA’18 Stage 20: Yates And Mucho Mas Lopez – 1 2 3! 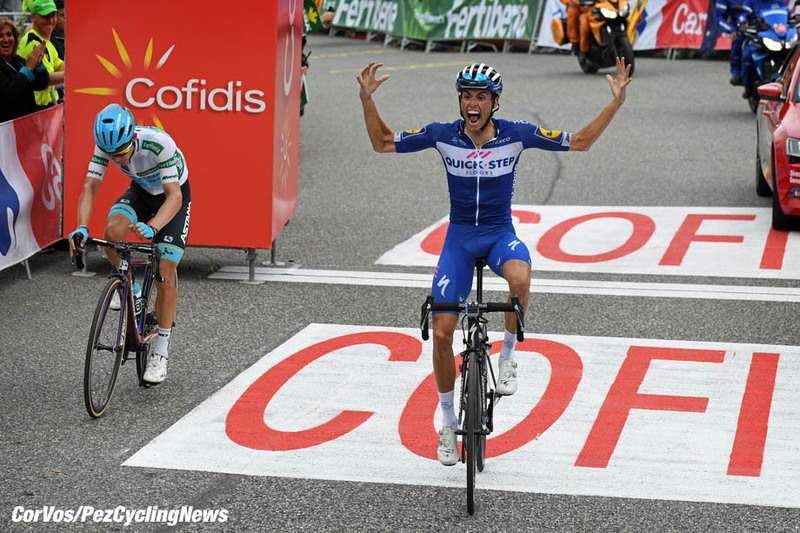 Stage Report: Spain's rising star Enric Mas (Quick-Step Floors) claimed the short but explosive penultimate stage of the Vuelta a España in the mountains of Andorra, while Simon Yates (Mitchelton-Scott) once again rode with panache to hold onto the red jersey, capping an exceptional year that has seen Britain claim all three of cycling's Grand Tours, an exploit matched only by France in 1964 and Spain in 2008. "Roule Britannia! ", "Que Viva Valverde! ", "Kruijswijk Konquers All! ", "Weapon of Mas Destruction! ", "Superman Returns!"... 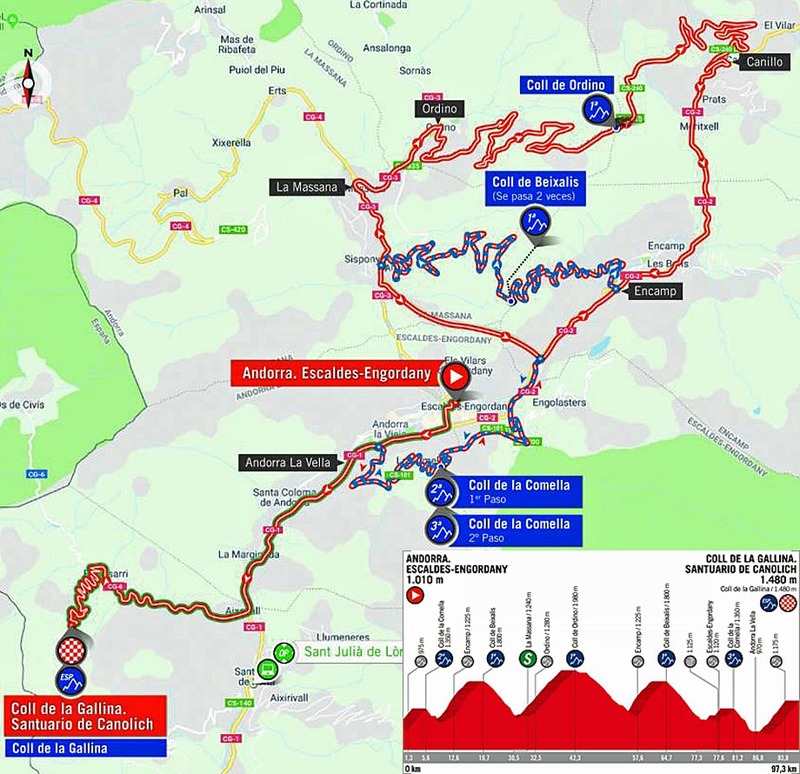 On the morning of Stage 20, a series of preposterous prospective headlines were rolling off the tongues of journalists in the Tour of Spain's press room in anticipation of the action that was to unfold in Andorra. Some, shame be upon them, even dared consider the untenably cake-taking "Yates He Can!" Excitement was in the air. Who would claim the red jersey was still anyone's guess. 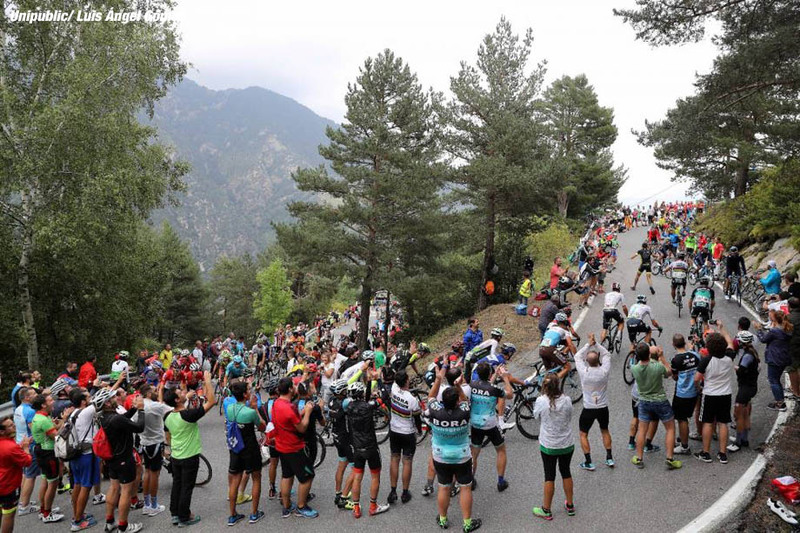 A procession-style ride into Madrid still awaited the peloton on Sunday but nobody could doubt that the winner of la Vuelta would be determined this Saturday in the Pyrenees. The final wearer of "la Roja" would emerge after 97.3 kilometers of strenuous racing, set wholly within the borders of the landlocked microstate, and packed with six categorised climbs. Short and sharp, none exceeding ten kilometers in length but all presenting punishing gradients, and-crucially-coming hot on one another's heels, these promised to set the race on fire and provide spectators with a pyrotechnic finale of the most entertaining variety. 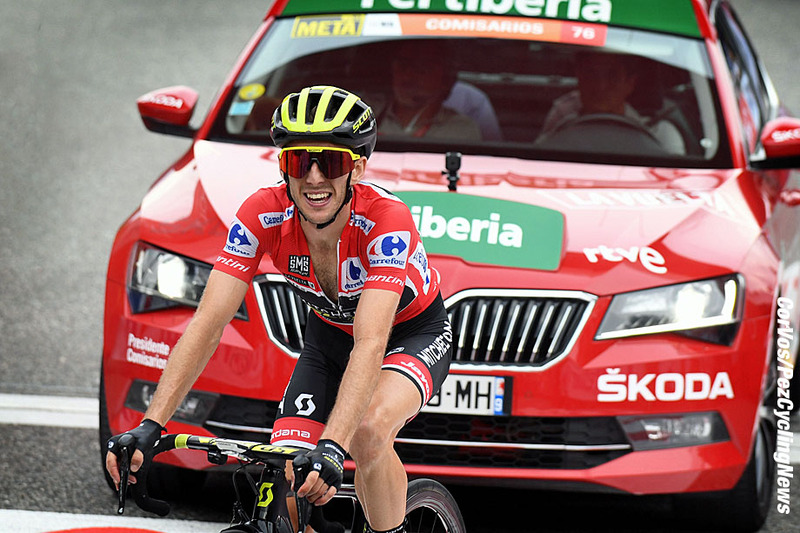 Britain's Simon Yates carried over into Stage 20 a 1 minute and 38 seconds advantage over the second-placed rider in the General Classification, Spanish veteran Alejandro Valverde, and looked like the clear favorite to pull on red in Madrid. Indeed, according to most observers, Valverde would have his work cut out holding on to his runner-up spot, threatened by the likes of the broad-shouldered Dutchman Steven Kruijswijk, a mere twenty seconds farther adrift in the overall rankings, and by the petulant Spanish revelation Enric Mas, lying no more than 37 seconds down on his feted compatriot. Yet, Yates remained haunted by memories of last spring's Giro d'Italia, when he collapsed on the gravelly slopes of the Colle delle Finestre while wearing the race leader's pink jersey and finished the race in Rome over an hour behind Chris Froome. Would history repeat itself? Or would the boy from Bury instead weather the storm to claim Britain's fifth successive Grand Tour crown? 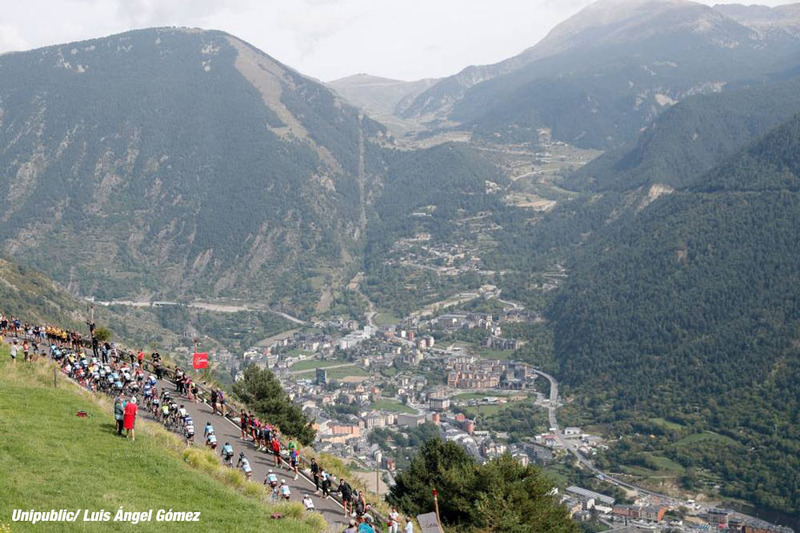 A grouped peloton followed race director Javier Guillen's iconic red car over the opening portion of the day's course, through the packed streets of Escaldes, but the paradox of a stage set in Andorra without evasion lasted only a kilometer, after which Sky's British debutant Tao Geoghegan Hart uttered the day's inaugural "Adios, amigos!" and disappeared up the road. Those expecting a belated hurrah from Australia's Richie Porte or Italy's Vincenzo Nibali, two top tier champions that had thus far failed to impress on the roads of Spain, were in for a disappointment, "the Tasmanian Titan" prolonging his invisible man act at this Vuelta and "the Megalodon of Messina" demurring from raising his fin above the surface, both seemingly favoring rainbow over red and saving their strengths ahead of the World Championships in Innsbruck later this month. As the riders progressed up the early Coll de la Comella under cloudy skies, Belgium's King of the Mountains Thomas De Gendt launched a counter-attack and soon found himself in front, surrounded by a large group of baroudeurs, with an advantage of one minute over the "grupo del lider". The tireless Dutch grimpeur Bauke Mollema, Polish champion Michal Kwiatkowski and his grimacing compatriot Rafal Majka, a former polka dot jersey at the Tour de France, as well as Vuelta stage winner Michael Woods of Canada, featured among the bearded Belgian's companions. Nibali also made an appearance, though for the storied campionissimo this looked more like a warm-up ride. De Gendt hoovered up the points at the summits of the Comella and the day's second ascent, the wretched Coll de Beixalis, tightening his grip on the blue-spotted jersey, while farther down the road Nairo Quintana rose from his saddle and applied some early pressure on Yates. 'El Condor', chased down by the race leader's neon green-shouldered Mitchelton-Scott team-mates and Kruijswijk's wasp-like black and yellow Lotto NL-Jumbo guard, could not stay away but his accelerations whittled down the peloton. Fabio Aru, winner of la Vuelta in 2015, attempted to bridge over to the "cabeza de carrera", the Italian ex-great dragging the likes of Spain's Jesus Herrada and the Tatar Terror Ilnur Zakarin in his slipstream. Soon enough, the front group had bloated to fifteen members, though Aru himself had mysteriously vanished by that point, only to later reappear, half an hour adrift, far behind the peloton. 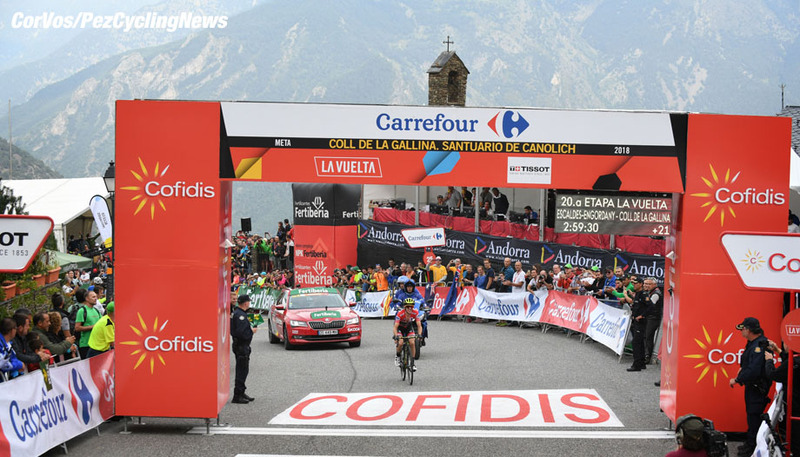 On the slopes of the first category Coll de Ordino, Cofidis's Herrada, a former race leader, escaped alone in a bid for glory, cutting a solitary figure along Andorra's arcadian pastures. 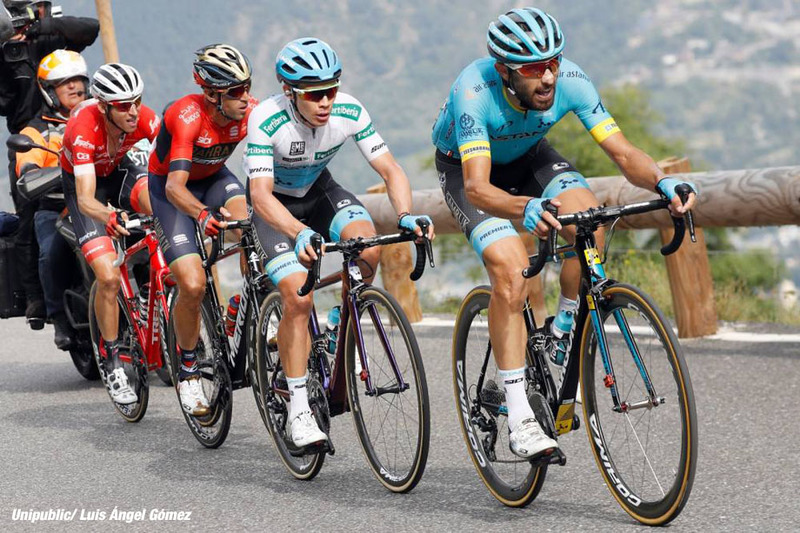 Behind him, the Astana formation grabbed the reins of the peloton, eating into the break-away's lead, the Kazakhs' star man Miguel Angel 'Superman' Lopez evidently eyeing victory and a place on the podium. 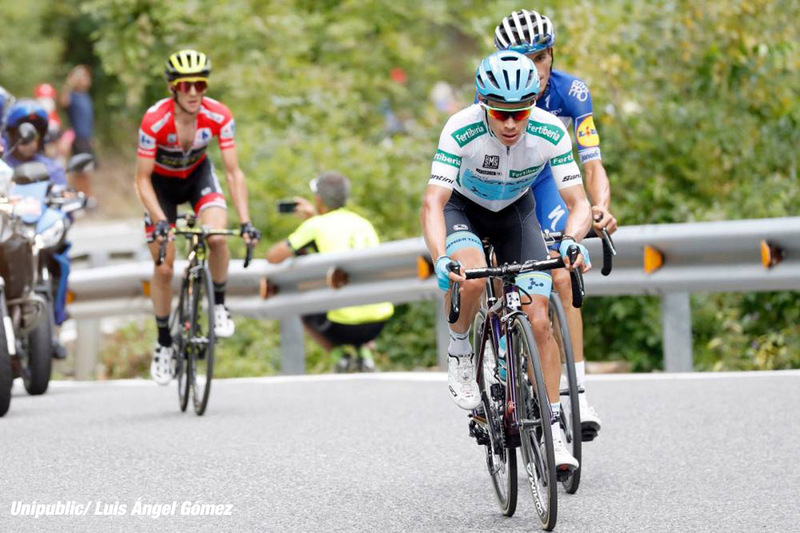 At the summit, 54 kilometers from the finish, Herrada's lead stood at a minute and a half. 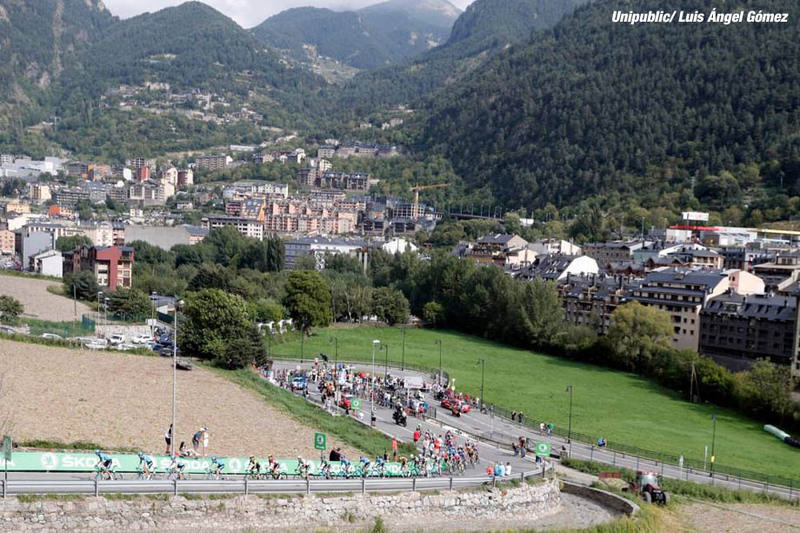 The day's fourth climb, up the Beixalis again, saw Herrada caught by the rest of the break-away and Lopez exit the peloton with several domestiques in an effort to catch them. The turquoise express made for the summit, triggering no immediate reaction from Yates or the other favorites. 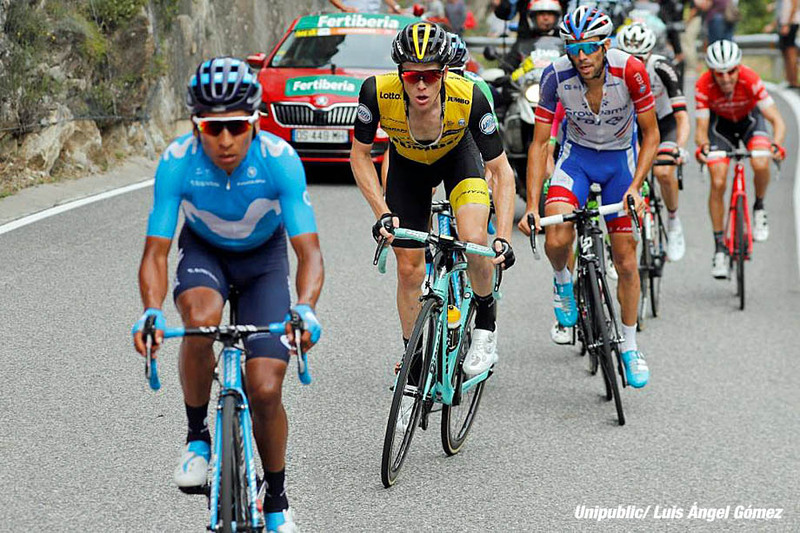 Shortly before the summit, the classy Colombian climber made contact with what little remained of the lead group, reduced to a handful of hopefuls including Spain's De la Cruz (Sky), Mollema and Majka. In the ensuing descent, however, Yates's men chased Lopez down relentlessly, causing a junction. No sooner had they done so than another Latin American, in the form of Quintana, rocketed out of the peloton, gaining a few seconds. Lopez then attacked again at the foot of the fifth and penultimate climb, a repeat of the Coll de la Comella, but this time tackled from a different side. The two Colombians joined forces in the lead. As the red jersey group neared the top of the climb, Yates decided to throw caution to the wind and attack in person, dropping everyone but Mas. The two men crested the Comella seconds behind Lopez and Quintana, and set their sights on bridging over to them in the descent. With the Coll de la Galina (a 3.5 kilometre-long climb boasting a stinging average gradient of 8.7%) looming, two and two became four, Yates's dream of winning one of cycling's Grand Tours now palpable. Valverde and Kruijswijk, stuck in the peloton half a minute adrift, looked like the day's losers. Of the front quartet, Quintana, not unpredictably, proved the first to falter, losing ground in the opening part of the Galina. It soon became clear, though, that the Movistar man had in fact been called back to assist the fading Valverde. But by now the 2009 champion was beyond helping, and soon lost his place in the peloton. The crowds at roadside cheered and cheered, willing the wearer of the green "puntos" jersey up the mountain, but all the "Venga Valverde! "s in the world could not save the great Spaniard, his age finally catching up with him as over 3,000 meters of vertical climbing truly began to take their toll. Kruijswijk also began to wobble, 'the Kolossus' struggling on the steep slopes and proving incapable of holding onto his place on the podium. 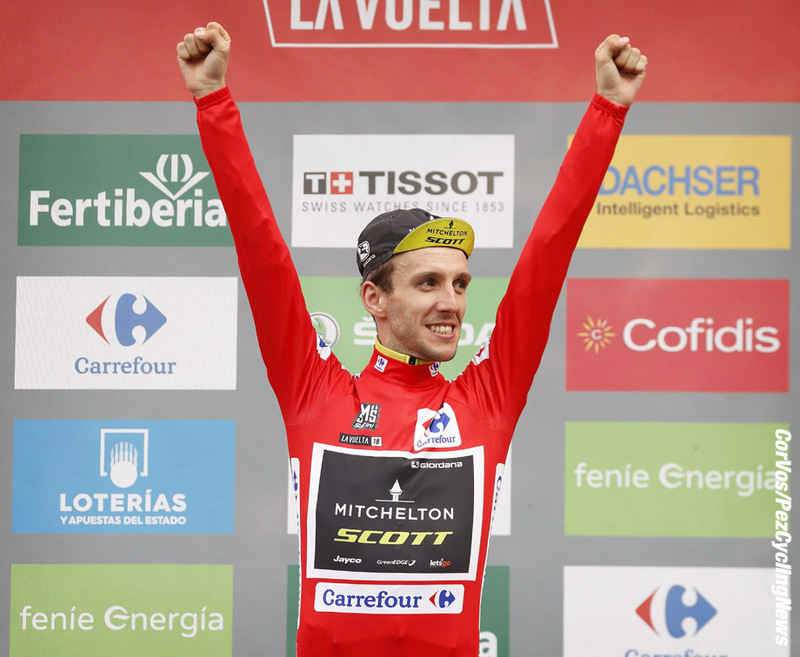 Dancing on his pedals like a little red devil, Yates now looked every bit the champion-elect. With 5 kilometers remaining to the finish, the Englishman could relax a little and allow Mas and Lopez to escape. 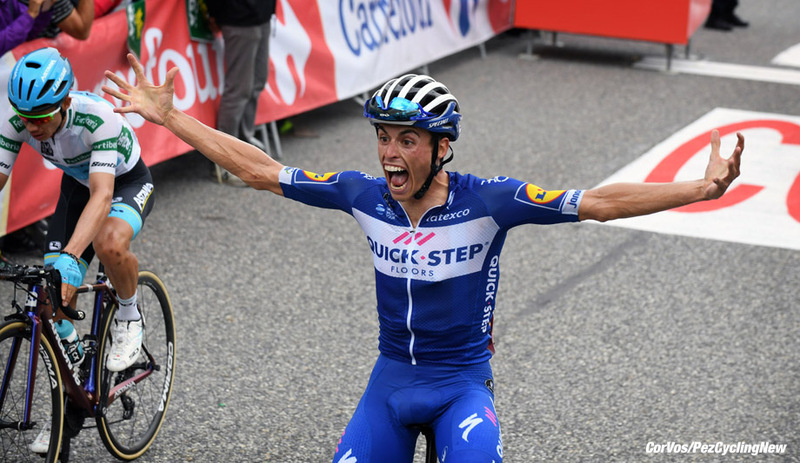 The pointy-nosed Spaniard in the intense sapphire of Quick-Step and the poker-faced Colombian in the immaculate white of the combined jersey took turns attacking one another, as the soon-to-be Sir Simon hovered a few seconds behind them. In the final sprint, Mas took the initiative and darted over the line to claim an impressive stage victory and secure second place in the GC. Lopez, though defeated, could console himself with the third step of the podium. And if anyone was still in need of a demonstration that if there is a god of cycling he wears Union Jack-emblazoned sweaters and guzzles fish and chips, Yates gladly provided it by cutting the line in third place, a mere 23 seconds after the winner, to seal overall victory. 'The Bruiser from Bury' had at long last exorcised the demons of the Finestre and fulfilled his potential. 25. Jesus Herrada (Spa) Cofidis at 7:09.